With summer ‘finally’ making its way to the frozen tundra of Wisconsin, my family and I make some changes to our eating patterns. On weekends when the weather is nice, we all like to be outdoors. Whether it’s mowing the lawn, working in the garden or out on the boat, eating breakfast, lunch and dinner is not always part of the plan. I like to cook a bigger breakfast and then we usually don’t eat again until we put something on the grill for dinner. 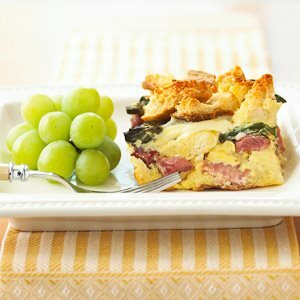 If this is an occurrence at your house (or even if it’s not) here is an excellent recipe for a hearty breakfast that I’d like to share! Bring a large pot of salted water to boiling. Add asparagus; cook 5 minutes or until bright green. Drain and place in a bowl of ice water to cool; drain. In greased 3-quart baking dish spread half the bread cubes. Top with cheese, onion, chives and half the ham and asparagus. Top with remaining bread. In a bowl whisk together four of the eggs and the milk. Evenly pour over layers in dish. Press down bread pieces into the egg-milk mixture with the back of spoon. Top with remaining ham and asparagus. Cover; refrigerate until ready to bake. Bake, uncovered, in a 325 degrees oven for 30 minutes. With the back of a wooden spoon, press 6 indentations in top of strata. Pour a whole egg into each indentation. Bake 20 to 25 minutes more or until an instant read thermometer inserted in center of strata registers 170 degrees F and eggs are set. Let stand 15 minutes. Cut into squares to serve. If desired, drizzle lightly with olive oil and sprinkle with salt and cracked black pepper. Makes 6 to 8 servings. 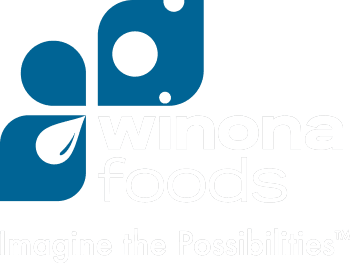 As always, make Winona Foods your source for white cheddar, Gruyere or any of the other wonderful cheeses that Winona has to offer. Happy Summer!